Get ready, Jacksonville! 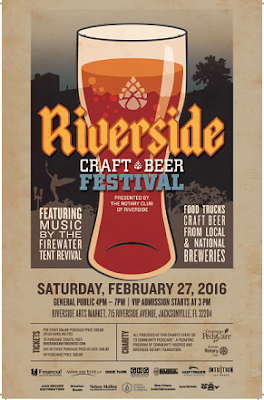 The area's first large-scale beer fest of the year is coming your way Saturday, February 27. Here's the what, where, when, who, how and why. It's a big party along the river that you won't want to miss! What is it? 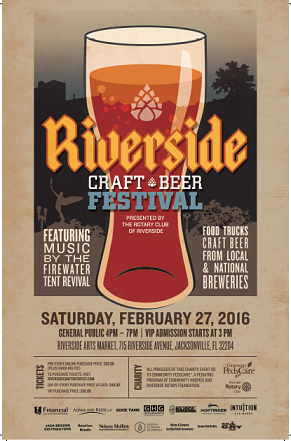 Third Annual Riverside Craft Beer Fest presented by Riverside Rotary Club of Jacksonville. Where is it? Under the Fuller-Warren Bridge at the home of the Riverside Arts Market, Jacksonville. When is it? It's this Saturday, February 27. An early VIP entry starts at 3pm, with General Admission at 4pm. Fest runs til 7pm. Who is putting this together and who will benefit? The Riverside Rotary Club of Jacksonville is presenting the third annual fest. Proceeds will benefit Community Peds Care (a division of Community Hospice) and the Riverside Rotary Foundation. Community Peds Care is a program for children with life-threatening medical conditions and provides support for the kids and their families. The Riverside Rotary Foundation disburses funds to a number of various charitable organizations around the Jacksonville area, including schools, military service personnel, and other causes. Roughly 4000 people have attended each of the past two fests! How do I get tickets? Get your tickets through the link above on the fest website, or through the fest Facebook page. But, you might not want to wait too long..... Advanced online tickets will be available through Wednesday, Feb. 24. The VIP ticket gets you tasting some special beers starting at 3pm (that's an hour early), cost: $50. The General Admission ticket admits you to the main beer sampling, starting at 4pm. Cost is $35 if purchased early. After that, GA ticket price is $40 (so, if you snooze on this, you end up paying an extra $5). This year the event is by wristband. For the one entry price, after you get your wristband, you'll be sampling unlimited beer (while they last!) in your festival beer cup. Oh, yeah, you have to be at least 21 years of age for that to happen. If you're a Dedicated Driver, you get in free (no beer for you, but your friends will thank you for it). Why do I want to go? Really? It's beer, for one thing! And, as of this writing, it looks like the weather is going be fantastic this year! (I take no responsibility for Mother Nature, however; or local weather forecasters). What I can tell you is that you'll be able to sample unlimited tastings of beer from local area breweries, Florida breweries, and other regional and national breweries, including some that you may not have had before or that have not been available in the Jax area. You'll be able to satisfy your munchies right there on site through the 11 food trucks who will have a variety of eats available to purchase. How about music? Grandpa's Cough Medicine will entertain from 3-4:30pm, and Fire Water Tent Revival takes the mic from 4:45-7pm. So, that'll get your feet stompin'. But what about the beer? There will be quite a bit of beer. Take a look at the anticipated beer list HERE. Your ticket purchase will help out the local charities mentioned above. So, tell your friends, too. If you need a ride back afterwards, don't call me, but you can request an Uber ride: if it's your first time using Uber, use code "RCBF2016" for that first ride free (up to $15). You can also use the BrewNymph code "uberBrewNymph," too. If you're new to craft beer, there's no better way to get your taste buds introduced than by attending a beerfest. And, if you're a beerfest regular (like the person writing this), you know that these events are fun, you'll get some beer you probably/likely haven't had before, and, you can talk beer with other beer nerds -- you don't even have to know them; beer people will pretty much talk to anyone about beer. Enjoy the music, and enjoy the awesome weather and scenery at the river. I think that about covers it, so there's one more thing you need to do: Get your tickets for the Third Annual Riverside Craft Beer Fest! I'll see you there! There's always an event going on somewhere that involves beer. I have two calendars of events on this website (beer fest type events/special events; and local North Florida/904 tappings and the like), so take a look at 'em, and go to some!